snowdeal.org > ex machina: designers of the sb600 flash, i applaud ye. designers of the sb600 flash, i applaud ye. sure, i probably shouldn't have been so rash in deciding to take apart my perfectly functional sb-600 flash, but what can i say, i like to take things apart. as someone who used to set land speed records for removing the central nervous systems of fruit fly larvae, i'm quite comfortable with manipulating teeny, tiny parts and pieces. 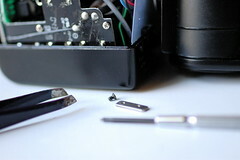 but the designers of the sb-600 almost had me beat with their devious industrial design that seemingly intentionally makes it nearly impossible to put all the pieces back together again. clever and confounding, but ultimately i claimed victory and the flash lived to see (hopefully) many more days.